The most significant policy issues and business decisions of the day are increasingly related to new challenges formed as a result of digital innovation. 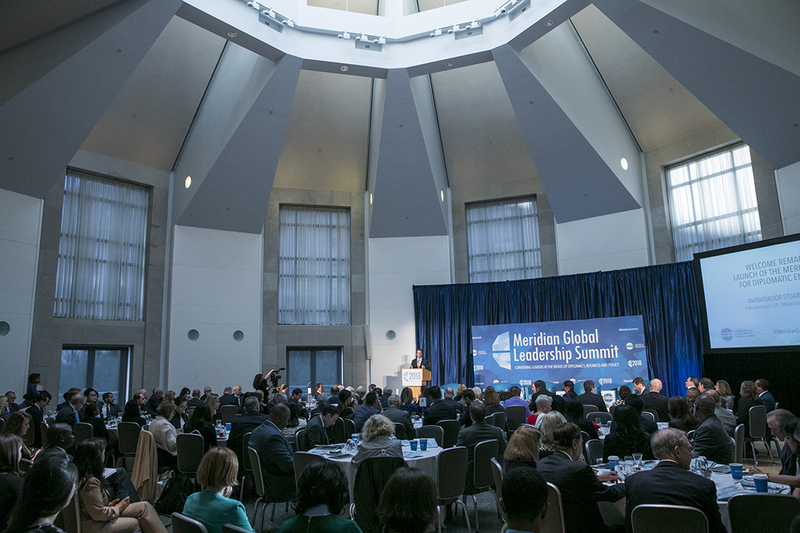 Public and private sector leaders around the world are forced to make quick decisions as questions of security, economic growth and job stability mount. 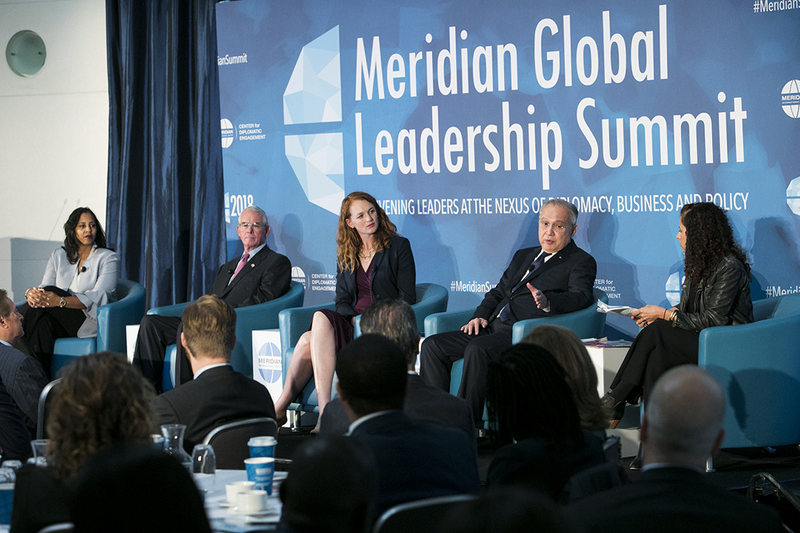 The 7th Annual Meridian Global Leadership Summit gathered 200 business executives, foreign ambassadors, government representatives and policy experts to explore how global leaders are responding to these swift changes and preparing for a digitally-driven future across sectors and borders. The impact of automation on the workforce continues to be one of the biggest concerns inside the United States and across the globe. Countries and regions are considering different approaches to overcome what many see as a looming global skills gap. 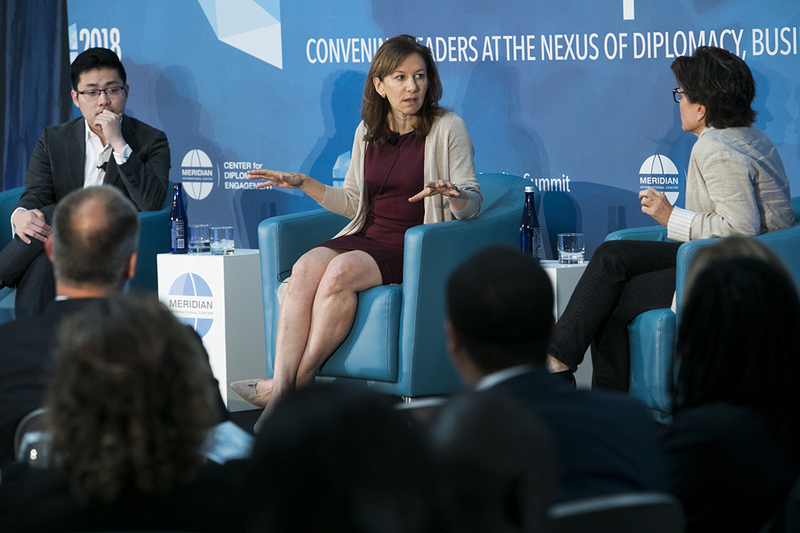 The Summit kicked off the theme of “Tech and Innovation Disrupting Borders and Sectors” through a panel discussion, moderated by Foreign Policy Deputy Editor Sarah Wildman, that examined these various strategies and how the public and private sectors can work together to prepare the future workforce. New America’s Molly Kinder set the stage by acknowledging that while worker displacement will occur, much can be done to avoid a jobs doomsday scenario. Congressman Francis Rooney shared his experience running a construction company and how this has led him to consider a range of workforce training initiatives, while United Airlines VP for Community Affairs Sharon Grant emphasized how the airline is leveraging technology to invest in youth and prepare them for the jobs that lie ahead. Investing in youth and education was part of the solution posed by Philippines Ambassador to the U.S. Jose Romualdez. He explained how his country with over 1 million call center jobs is preparing their citizen for the future of work. Whittle School & Studios CEO Chris Whittle elevated the attention towards a rethinking of education advocating for a new school versus an old school approach. Opening campuses in Washington, DC and Shenzhen, China next fall, Whittle School will provide a common global curriculum that will use technology to equip students with the skills needed for the jobs of 2025 and beyond. Online privacy is another major concern of policymakers and their constituents. In the wake of California’s data privacy legislation and the recently-enacted General Data Protection Regulation (GDPR) in the European Union, the question is no longer if governments will regulate giant tech platforms, but when and how. 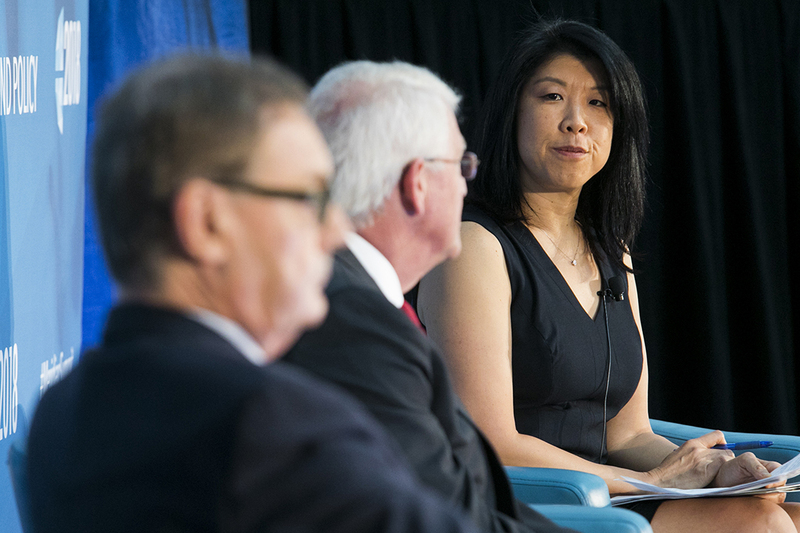 The New York Times National Technology Correspondent Cecilia Kang guided a conversation with Senator Roger Wicker and EU Ambassador David O’Sullivan on what regulation we can expect in the United States and how Europe is responding to laws that are already on the books. Senator Wicker agreed that federal regulation is coming soon and that we should expect Congress to pass legislation before the end of 2019. On the other hand, Ambassador O’Sullivan contended that data privacy laws are nothing new in Europe having been around since the 1990s. He elaborated that GDPR is different in that it carries an enforcement mechanism. Regulation of the leading social media and technology firms was also among the issues addressed by Council on Foreign Relations Senior Fellow for Digital Policy Ambassador Karen Kornbluh, FiscalNote Founder and CEO Tim Hwang, and Recode Executive Editor Kara Swisher. Ambassador Kornbluh argued that regulation is sorely needed as the lack of transparency shared by these companies is harming democracy. The concern shared by all three is that this Administration is not adequately preparing to tackle these issues as evident by the number of unfilled leadership positions, such as Chief Technology Officer, Chief Science Officer, and White House Cyber Coordinator. 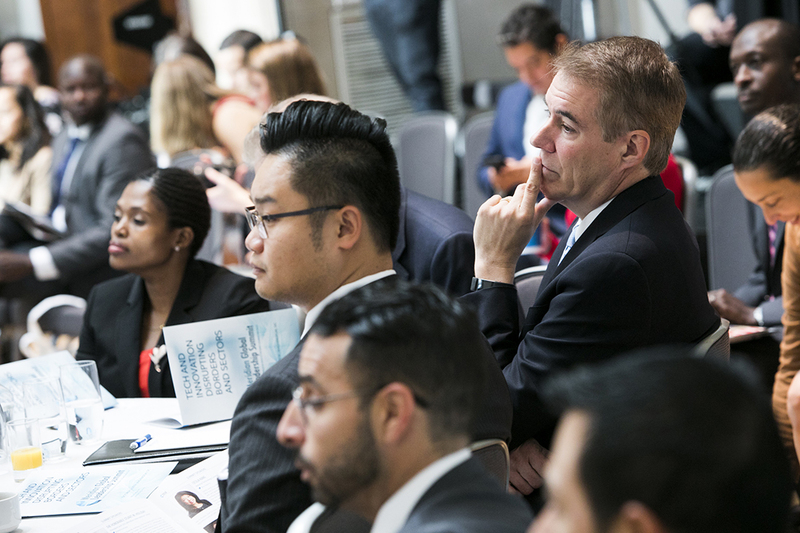 United Airlines CEO Oscar Munoz aptly tied everything together from workforce preparation to how a very public-facing company can adapt to a world where information travels exponentially faster than any aircraft. 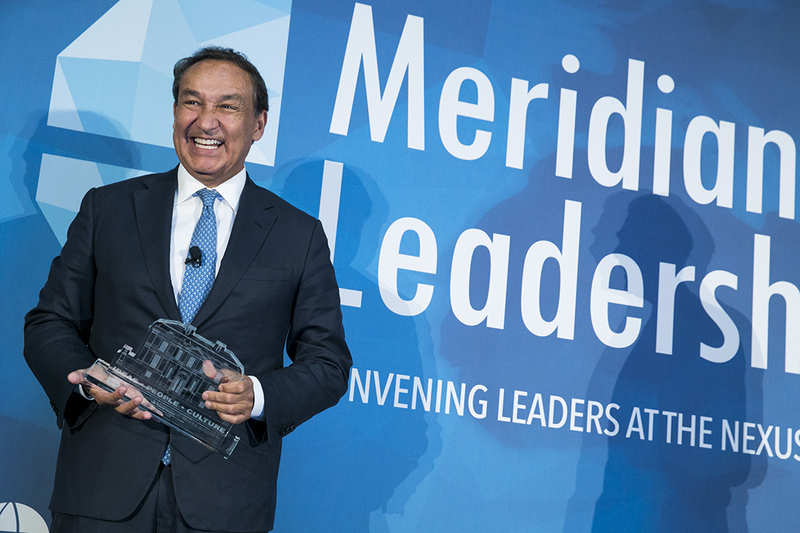 In conversation with Meridian Chairman and Albright Stonebridge Group Chair Secretary Carlos Gutierrez, Mr. Munoz emphasized that while leadership acumen in the digital world requires the leveraging of technology, the focus must remain on people. In particular, it is the act of caring about the needs of both customers and employees. Following his fireside chat, Meridian President and CEO Ambassador Stuart Holliday presented Mr. Munoz with the Meridian Corporate Leader Award, which recognizes exceptional business leaders whose vision and management abilities have increased international collaboration, made societal impact a corporate priority, and helped his/her company succeed in a global marketplace. 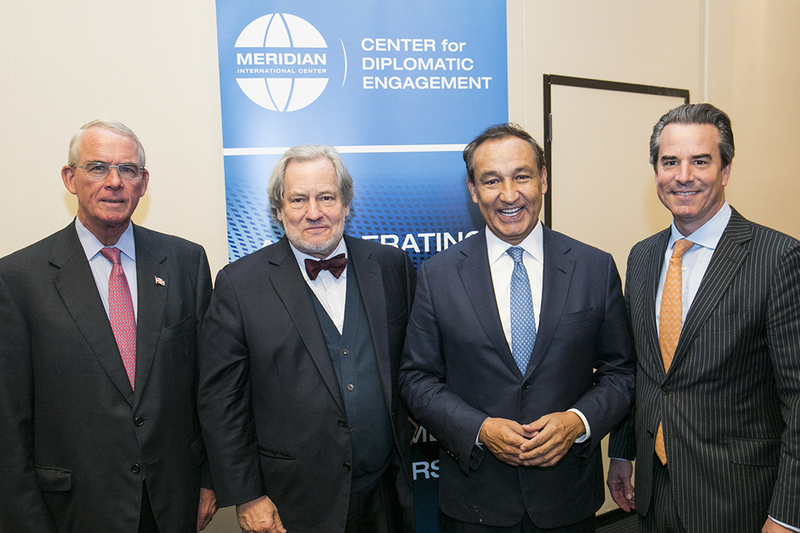 Ambassador Holliday also announced the establishment of the Meridian Center for Diplomatic Engagement. 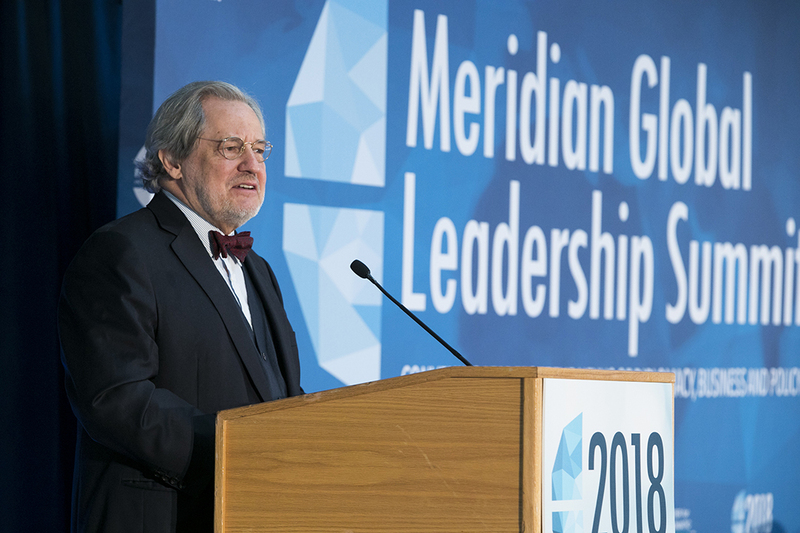 An evolution of Meridian’s convening pillar, this new endeavor accelerates collaboration between the international diplomatic corps and the U.S. public and private sectors to address global challenges and opportunities facing the United States and the world today. 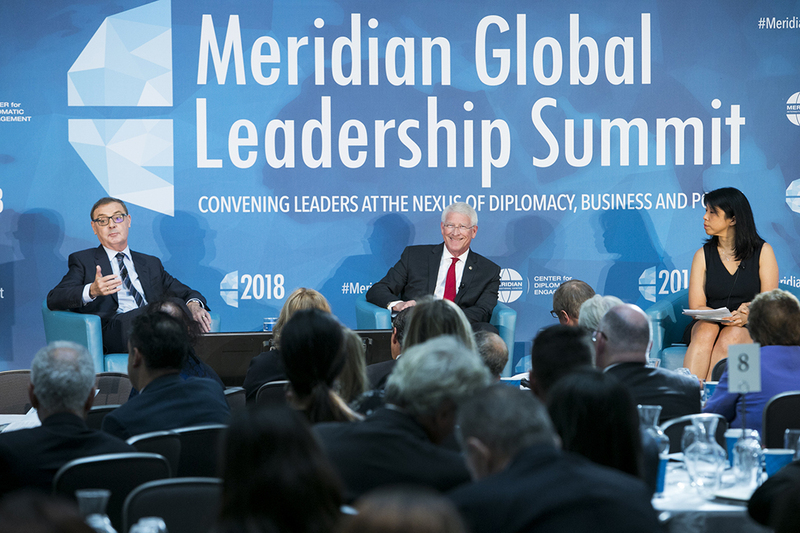 As Ambassador Holliday commented, it extends the premise for the Meridian Global Leadership Summit – connecting leaders at the nexus of diplomacy, business and policy – into a full-time enterprise.